Ainsley Moss has returned home after graduation to the small town of Aurora Falls. Her mother pulls some strings to get her a job at the town’s newspaper as an obituary writer, to replace the one who just died, and a place to live, sharing a home with Gage Sullivan, a guy she’d dumped when they were in school. Coming home isn’t all it’s cracked up to be as Ainsley quickly finds out. Her ex-best friend who now also works at the newspaper attacks her in the ladies room because she doesn’t want Ainsley working at the newspaper. Shortly thereafter, Ainsley finds her dead in a stall in the ladies room and Ainsley is arrested. 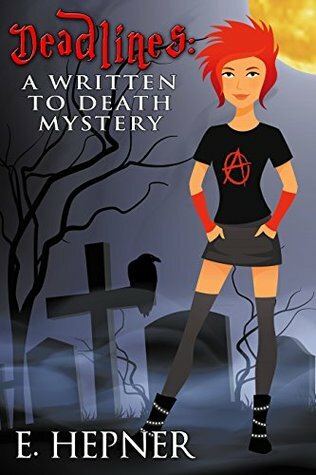 Now, Ainsley has a real motive to find the actual murderer, while at the same time trying to write two obituaries, for the ex-obituary writer and her ex-best friend. The town of Aurora Falls is filled with gossip and weird, funky characters. As Ainsley and Gage start gathering information for the obituaries, they also gather clues about the murder, a murder which is quickly followed by a second. As the plot thickens, Ainsley and Gage become more and more tangled in the investigation. Ainsley is a fun character, who is very scattered. She doesn’t seem to know what she wants, and I’m not at all sure what Gage sees in her. But given the nature of her controlling mother, it’s a wonder Ainsley is able to function at all. I did find a number of characters in the novel to be a bit over-the-top, especially the aunt of the first victim. And the murderer turns out to be someone very unlikely. Mystery readers in search of some light-hearted fun and a story filled with quirky characters will find all of that in Deadlines, the first in a series. It will be most interesting to see what Ainsley gets up to next.